NGC 1333 is a blue reflection nebula with associated star forming regions in the molecular cloud/dust region in the constellation Perseus. The star forming regions contain many new stars less than 1 million years old. Red regions of ionized gas energized by these young stars can be seen in the image. 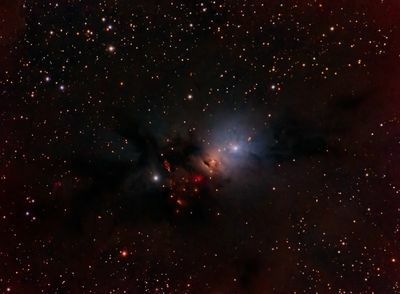 Also seen to the left of the blue reflection nebula is the dark nebula Barnard 205. Image is a total of 5 hrs 45 min combined exposure taken on the nights of 23, 27, and 28 October 2014 taken with a SBIG ST2000xcm camera and TeleVue 140 f/5 refractor on an Astro-Physics 1200 mount (23 x 15 min lights @ -20 degrees, dithered; 32 darks; 128 bias; 128 flats). Software: Sky X; Image acquisition with MaxIm DL 6.05; Calibration, registration, and integration in PixInsight; Processing with PixInsight 1.8.3.1123 Ripley (x64) and Adobe Photoshop CC.